Your Ipe and Brazilian Decking source in Atlanta. If you need Ipe hard wood decking, we have it. If you need Ipe advice, call us. If you need Ipe support, we provide. Ipe, or any of the Brazilian hardwoods are beautiful and last a lifetime, actually many lifetimes. Your Atlanta home will be enhanced with an Ipe or Brazilian hard wood deck. In addition to ipe, we also have Tigerwood, Garapa (Brazilian Oak), Jatoba (Brazilan Cherry), Cumaru (Brazilian Teak), Massaranduba (Brazilian Redwood), angelim pedra, and more. Want more reasons for Atlanta Ipe Decking? Brazilian Ipe decking is realhard wood decking that provides amazing beauty and durability in your Atlanta deck or porch. Brazilian hardwood Ipe decking naturally resists rot, insects, and decay so it will not require any treatment or chemical protection. Brazilian hardwood decking naturally weathers to silver gray or you can maintain the original color with the use of a quality finisher with UV inhibitors. Brazilian Ipe decking is sold in even lengths (up to 20’), widths, and thicknesses to allow large design flexibility with no upcharges or unexpected costs. You can use either conventional and tongue and groove profiles to meet your personal or professional needs. Ipe hard wood handrails, dimensional lumber and black iron Fortress railing products are also available. Several hidden fastening systems are also available to meet your design needs. We carry color face screws which will enhance the visual impact of your Ipe hardwood deck. Brazilian and Ipe Wood Decking provide for lasting results without the use of dangerous chemicals or plastic composites. Still undecided? What about composites? Still have a million and one questions? Here are some answers. Composites are plastics and are not the best for the environment. Remember, plastics never decompose in a landfill. Atlanta has too much waste today. Long term, composites will add to this problem. Real Ipe decking is grown from the soil and will return to the soil. Remember, as a tree grows it is pulling Carbon from the environment. Plastic only adds Carbon to the environment. We always buy from responsible mills and sustainable forests. In addition to ipe coming from sustainable forests, our tigerwood, cumaru, jatoba, massaranduba, garapa, and angelim decking also do. In fact, all our woods including cedar and cypress or others come from sustainable forests. What about PT? Chemicals like ACQ are okay for framing but you probably do not want to be walking on it. There has been bad press about this over the years. In addition, the beauty of Ipe far outshines PT on any deck. We can supply any needs you have for Ipe decking or any Brazilian Hardwood decking. In addition to ipe, we also have garapa, tigerwood, cumaru, jatoba, massaranduba, angelim pedra, and more. When you buy from us we will provide the complete deck package including fasteners such as Ipe Clip Extreme, Deck Clips, and Headcote screws. We also have railing systems both in Ipe and in powder coated iron Fortress Railing systems. 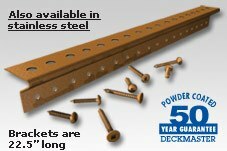 Another product that is becoming very popular is the DeckMaster under deck fastening system. Show at the left, you can use it for stairs when completing an Ipe Clip system or an entire deck. We have delivery to your home or jobsite. You can rest assured that your decking will look pristine as the day it left the mills in Brazil when you buy from us.